1. What is titanium ring? 5. How to care for titanium rings? Since its discovery in 1791, titanium, the metal which was given the name of a Greek mythological figure, has been widely used in diverse industries such as jewelry manufacturing and aircraft manufacturing. Titanium, the 22nd element in the periodic table, has gained a reputation for its high resistance to corrosion. Like many other metals, titanium can be mixed with other metals to produce alloy. The percentage commonly adopted in manufacturing titanium jewelry is 90% titanium mixed with 10% vanadium and aluminum, which is altered according to need. The pure metal titanium is grayish white. Its surface can be converted into different colors while being anodized. After being polished, the metal takes on a special smooth look which much resembles the texture of “satin”. Like other metals such as tungsten, its high resistance to corrosion enables it to retain colors and maintain its gloss. From the 20th century, titanium had been used in making jewelry, titanium wedding bands in particular. In addition to its excellent qualities, which are already mentioned above, what makes it so popular in the market is its affordable price. It is known that while considering how to price a wedding band, factors such as manufacturing, processing and qualities of materials are to be taken into account. That being said, wedding bands made from these two metals are very close in terms of their market prices. When it comes to weight, it depends on individual preferences. For those who prefer to feel the weight of their rings, tungsten wedding bands are ideal choices. On the contrary, for people who prefer lightweight rings, they are likely to choose titanium instead because of titanium’s light weight. Titanium is skin-friendly, relieving you of worries about skin allergies. Similarly, tungsten of good quality is hypoallergenic. However, it is under the condition that there is no cobalt added in the process during which a tungsten ring is produced. Find U Rings only uses tungsten of the highest quality and guarantees that no cobalt will be added in the process of crafting our tungsten wedding bands. The two metals are comparable in terms of strength and durability. While being tested on a Mohs Hardness Test Kit, tungsten carbide gains the highest point while titanium gains the sixth. While its extreme hardness makes tungsten carbide harder and more durable than titanium, this quality also makes this metal composite susceptible to crack. Under the same high pressure that breaks tungsten carbide, titanium is likely to bend and deform. Titanium is much stronger than many other metals. Because of its strength, a titanium ring lasts much longer than rings made from traditional metals such as gold and silver. Besides, titanium and its alloys are highly resistant to corrosions by chemicals which people are likely to contact in their daily lives. Unlike tungsten carbide ring which is highly resistant to scratches, titanium ring is relatively susceptible to scratches and tends to bend and deform while being put under high pressure. Titanium wedding bands are hypoallergenic. Those who are allergic to metals such as nickel, would be relieved of such worries. Because firstly, the metal itself is hypoallergenic, for which it even gains the name of being the most biocompatible metal. People with the most sensitive skin would rest sure that their titanium rings are comfortable to wear. Secondly, few other substances are added in the process of producing titanium rings. 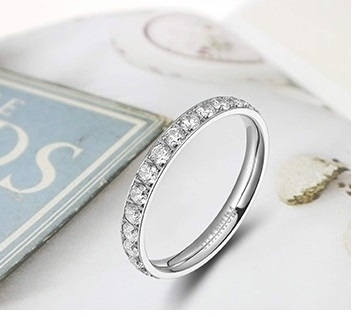 Last but not least, titanium ring is very affordable for those who have allergy issues. Light weight is one of titanium ring’s admirable qualities. In fact, with a density of 4.11, it earns the name of being the lightest metal that has been used in manufacturing jewelry. It goes without say that its light weight adds to the comfortable experience of its wearer, particularly those who prefer lightweight wedding bands. Titanium can be inlaid with different materials such as wood, other metals and ceramics. However, titanium is difficult to be forged into different shapes, for which there are limited styles of titanium available in the market. Despite this inflexibility, designers have tried hard to design titanium rings in trendy ways to fulfill the needs of customers who yearn for unique and fashionable titanium rings. Furthermore, this inflexibility also makes it difficult to resize a titanium ring, which further means that once damaged it is difficult to repair a titanium ring. HOW TO CARE FOR TITANIUM RINGS? Titanium rings are easy to take care of. Dishwashing liquid and glass cleaners (e.g. Windex) containing ammonia, these common household cleaners all can be used in cleaning titanium rings. If you want to revive the luster of your ring, glass cleaners are better choices. Do not scrub your ring or use cleaners with abrasive because scrubbing or cleaners containing abrasives are likely to destroy the anodized coloring.